The Represent exhibition, on display at the Philadelphia Museum of Art since January 10th, was developed by organizing curator John Vick and consulting curator Gwendolyn DuBois Shaw of the University of Pennsylvania to accompany the eponymous catalogue by Dr. Shaw and Richard J. Powell of Duke University. Represent showcases the Museum’s significant holdings of art by African American artists from 1801 to the present, including paintings, photographs, sculptures, and decorative arts. The interview below has been edited for clarity and brevity. Jessica Rohan: This exhibition was developed in conjunction with the release of a catalogue of the Museum's quite extensive collection of African American art, especially from the Philadelphia region. How does a sense of place inform Represent? John Vick: There are many artists in the catalogue and exhibition who had or have a strong Philadelphia connection, whether they were born here, raised here, went to school here, lived here, taught here, etc. That connection to the city dates back to the first work by an African American artist that the Museum acquired, The Annunciation by Henry Ossawa Tanner, and up to one of the most recent acquisitions, Jayson Musson’s Trying to find our spot off in that light, light off in that spot. And there are well over a dozen other men and women, likely more, that I could also name as having a local connection. As a result, I think when reading the catalogue or walking through the exhibition, one gains a sense of Philadelphia’s strong artistic and cultural traditions, while also seeing things made by artists who worked elsewhere around the country or abroad. JR: Represent showcases a variety of artistic mediums, and the exhibition itself is multimedia, with audio clips of interviews with contemporary artists. How do the audio segments play into the larger themes of Represent? JV: The interviews were done with ten artists in the show and were conducted especially for the show. The full interviews (each about 45 minutes) have statements about the artist’s life, work, career, aesthetics, philosophy, and so forth. We then edited the interviews down to smaller clips. This allows visitors to literally hear different voices talk about art, which is something we should encourage. It’s wonderful to provide visitors with an art historical approach to an exhibition. That’s what museums like ours are famous for and what my colleague Dr. Shaw and the other writers did so well in the book. But it’s also important to open up the conversation to other voices, to show that there are other ways of approaching and talking about art. Hearing directly from an artist in one way to do that, so we tried to make that possible. JR: How can an historical approach to issues of identity and representation provide context for the current iterations of black social movements in the United States? JV: I want to point out just one example of a work that I feel is especially relevant today (and a year ago we could not have guessed how relevant it would be by the time the show opened). That work is Joyce Scott’s Rodney King’s Head Was Squashed Like a Watermelon made in 1991. The work is most directly about the beating of Rodney King and was made immediately after that event. But even though it was made almost a quarter century ago, it still resonates with current issues—especially the brutality against African American men, the limits of police force, and the use of stereotyping language or imagery. Joyce Scott’s work is an example of how good art is often specific to its own time, but can have renewed meaning as it becomes a part of history and is seen by later generations. JR: You mentioned in a previous interview that a goal of both the catalogue and the exhibition is to foster access to the Museum's collection of work by African American artists. In your view, what is the value of increased accessibility for this collection in particular? JV: The catalogue and show also help promote awareness that the Museum has this great collection, that the collection dates back to 1899, and that we are continuing to grow the collection and do more with it. When dealing with work by African American artists, I think it’s clear that there is an additional need for opportunities to see, understand, and promote awareness of the work, simply because there has been too long a history of overlooking these artists or not giving them their deserved attention because of the color of their skin. We provide tours to visitors of all ages, but student tours are especially popular. They’ve been so popular with this show, in fact, that we are entirely booked for class visits. We also created a teaching resource for teachers who want their students to learn about the material. This can be done in conjunction with a visit, or separately if a visit isn’t possible. This, as with the full catalogue, also allows the material to be taught even after the show closes. These programs are a key part of the Museum’s mission to make its collection accessible and available to as many people as possible. And with children, it also helps to foster a love and interest in the arts from an early age, which is truly valuable. A show like this has been a strong reminder of what a fantastic collection the Museum has of works by African American artists and the demand to have it seen, studied, and experienced. As scholars and stewards of a civic institution, it’s our responsibility to do our best to continue to share the collection and respond to that demand. JR: There is an ongoing conversation regarding how black artists should or should not be obliged to express their identity in particular ways in their work. Could you speak a bit to that debate, and your approach to those ideas in creating Represent? JV: This is one of the key themes of the catalogue and the exhibition, and each artist engages the debate in different ways. As a result, we are able to see artists who have used their art to express African American identity—in ways that are personal, aspirational, political, general, or otherwise—and other artists who have chosen not to. That variety makes the experience of the works that much better. Additionally, it testifies to one of the most important things that art represents: freedom of expression. For me, among the most important aspects of art, art history, and art museums is the ability to show things made by individuals from different places and times. And these things—the art—is often made with or loaded with a sense of personal expression or broad social relevance or both. In that way, art allows us to gain not only a glimpse of another time or place (which the study of history or contemporary society also allow for), but to do so through the eyes, mind, and heart of certain and different people. In a way, art can make the experience of history more personal, and often very beautiful or visually stimulating, too, depending on the work. I think of the David Drake Storage Jar, which was made by an enslaved African American in South Carolina who signed his name and wrote poetic inscriptions on many of his ceramic works. Or Horace Pippin’s paintings End of War and Mr. Prejudice, which both deal with war and military segregation—experiences the artist had himself. Or Barbara Chase-Riboud’s abstract sculpture Malcolm X #3, which was more or less criticized as not being explicitly ‘black enough’ when first shown in the 1970s. The list goes on with works that can make us think about history, specifically the history of African Americans in this country. This doesn’t necessarily illuminate or provide answers to our present day problems, but it does provide a long history that we can compare to our present situation. It provides that history through the eyes of individuals, rather than through the kind of broader account that is often less personal and more authoritative. Represent will remain on view until April 5th. The Represent catalogue can be purchased here. On March 25th, the Museum hosted a Wikipedia Edit-a-Thon to improve the online representation of African American artists, along with performances by the Amber Art Collective and Tracie Morris. All images courtesy of Philadelphia Museum of Art. Cover image: Martin Luther King, Jr., 1981 by John Woodrow Wilson © John Wilson/Licensed by VAGA, New York. 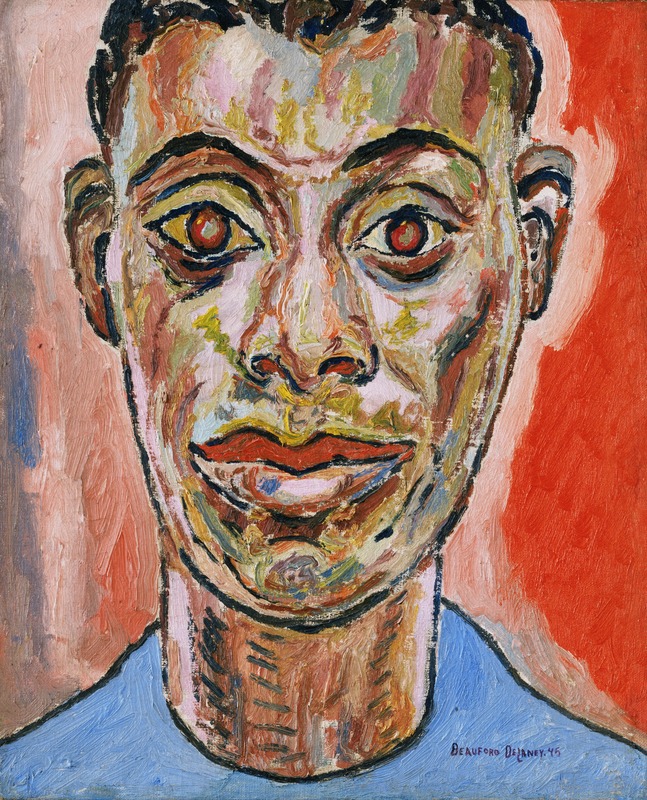 Portrait of James Baldwin, 1945, by Beauford Delaney. Philadelphia Museum of Art.